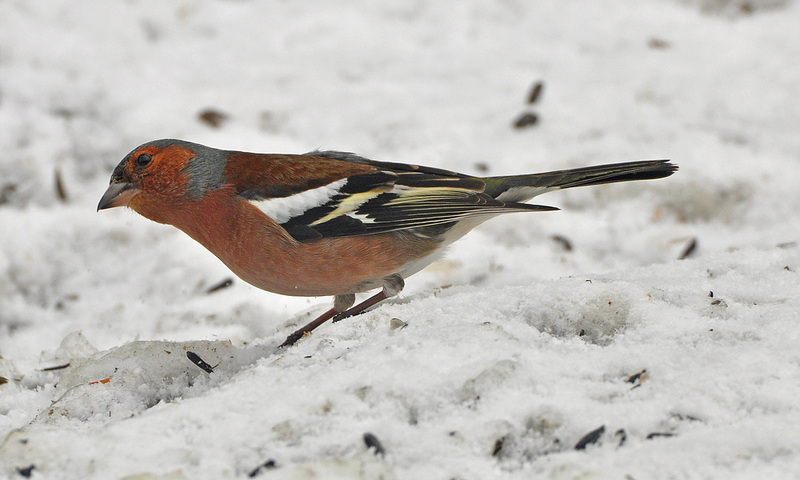 The unique location of Newfoundland, combined with the fact that Common Chaffinch is a very regular visitor to nearby Iceland, suggests that it could/should be expected as a vagrant to Newfoundland on rare occasions. I was surprised lunchtime Saturday when I checked the local bird news – a COMMON CHAFFINCH (ABA Code 4, 4th record for Newfoundland) was reported coming to a feeder in Corner Brook. I immediately went looking for details, and was soon rewarded when Jeff Siddal (a west coast birder/naturalist) sent me a grainy but very identifiable photograph taken by the homeowners, Hearder and Louise Butler. The Butlers have been actively watching their feeders for many years and are long-time FeederWatch participants – needless to say, they were very excited to be adding this to their list of backyard visitors! 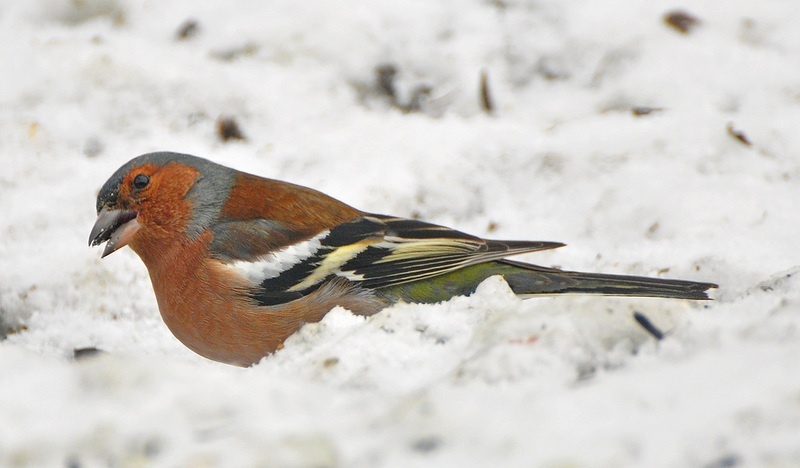 Common Chaffinch is considered one of the most abundant songbirds of Europe, breeding widely across the continent. Northern populations are highly migratory, making it a good candidate for vagrancy outside its normal range. However, the provenance of Common Chaffinch in North America is always questionable since they are commonly kept as cagebirds, and the vast majority of records in Canada and the United States are easily passed off as probable escapees. That being said, the unique location of Newfoundland combined with the fact that Common Chaffinch is a very regular visitor to nearby Iceland (where it does not breed, but occurs often enough that is has become hardly notable) suggests that it could/should be expected as a vagrant to Newfoundland on rare occasions. Our three previous records (two of which have also been in late winter) have generally been considered as wild, and the recent discoveries of a Gray Heron and Fieldfare (the latter having been just 50km away from the current Chaffinch location!) add to the feeling that this may also be a bona fide European vagrant. The next day (Sunday, March 17) Darroch Whitaker stopped by to visit the Butlers and was able to watch the Common Chaffinch for several minutes. He managed to capture a few excellent photographs, and described the bird as being “extremely skittish … [it] never paused under the feeder, rather would drop in, grab a seed, and dart back to the trees.” The photos seem to show a bird resembling the “coelebs” race typical of western Europe, which of course would be most expected as a natural vagrant to Newfoundland. This male Common Chaffinch was first reported in Corner Brook on March 16, but has apparently been visiting the backyard for several weeks. This marks a fourth record for Newfoundland! An exciting find!! And one that should entertain some of the birding community on the west coast of Newfoundland for the next little while, and torment those of us here on the Avalon Peninsula who just can’t justify the drive. Fortunately, many of us enjoyed the previous Common Chaffinch near Placentia in February 2011, or else there might have been a minor stampede across the highway. Stay tuned to the Rarity Round Up for regular updates, or feel free to drop me a line. This entry was posted in Uncategorized and tagged Common Chaffinch, European vagrants, Fringilla coelebs, Newfoundland, rare bird. Bookmark the permalink.